The New Palestine cheerleading team competed in Saturday’s Indiana Association of School Principals State Finals at New Castle. 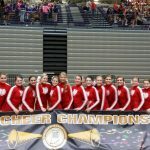 The NP cheerleaders finished second in the coed varsity division, giving coach Ally Jamerson’s a state runner-up finish coming a week after a runner-up finish at the Brownsburg semistate. The New Palestine competitive cheerleading team has advanced to the Indiana Association of School Principals State Finals, which will be held next Saturday at New Castle High School. 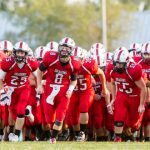 The time of the Dragons’ performance Saturday is TBA. The Dragons advanced by placing second at the Brownsburg semistate on Saturday.